I'm a southern gal living on the coast of South Carolina. I am an instrument rated commercial pilot, but I've never worked in the aviation industry (yet). In 2015 I quit my job with the local police department (911 dispatching and call taking) to travel the world with my husband, and I've been savoring every moment life has given me since. 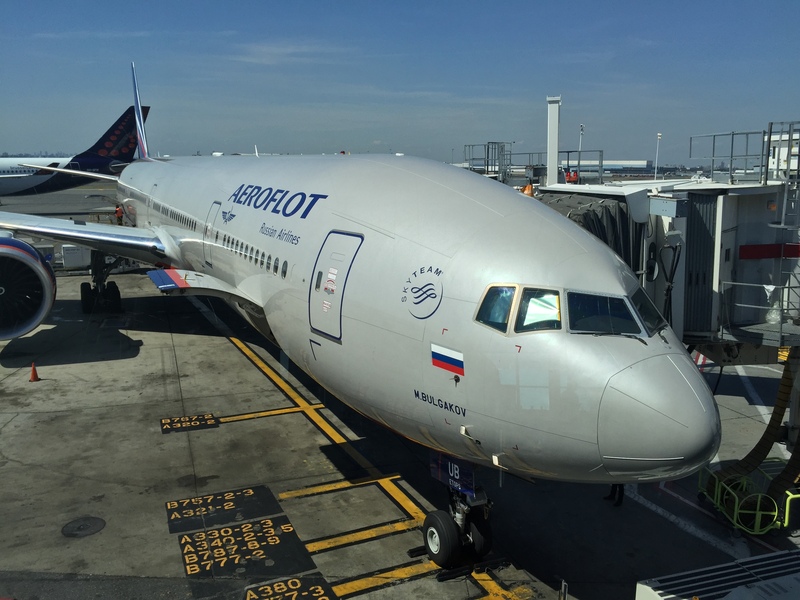 I have flown Aeroflot 101 from JFK to Moscow twice, with polar opposite experiences. The first time was in coach. It was a miserable experience, mostly because my seatmate was very large and took up all of her seat plus half of mine. I was looking at an entire vacant row of seats in front of me, but I could not move to that row because they were “premium” (bulk head) and I had not paid for premium. 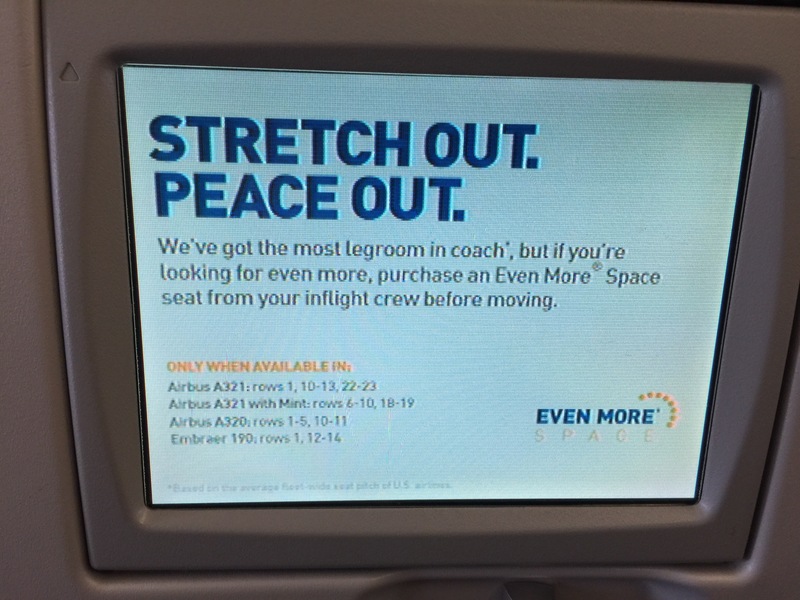 I would have gladly paid for an upgrade to be able to move, but it was not possible once the plane was boarded. If they’ll take payment onboard for Duty Free shopping, you’d think it would be possible to pay for an upgrade during flight. 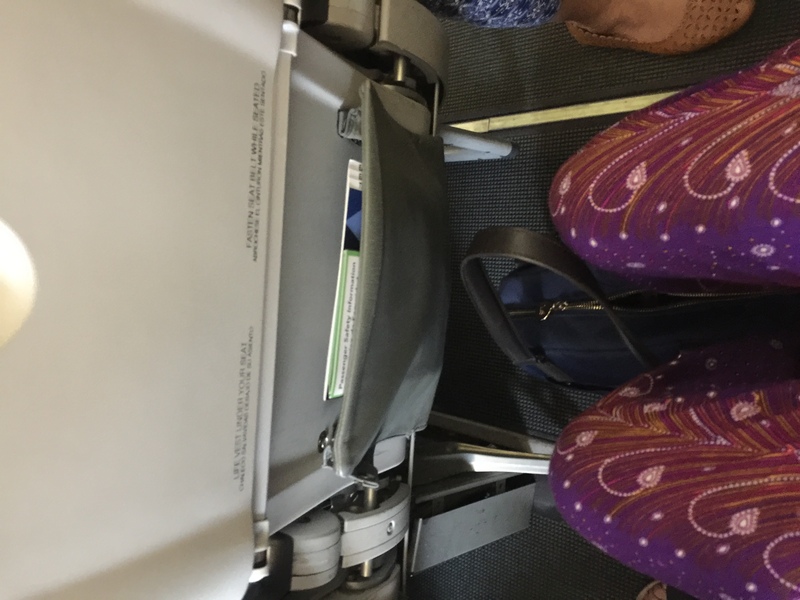 In any event, it was a VERY long and uncomfortable flight. I learned a good lesson about paying for an upgrade to a bulk head when given the option in the future. This time, however, I flew in Business Class. This experience was COMPLETELY opposite of my previous jaunt with this airline. 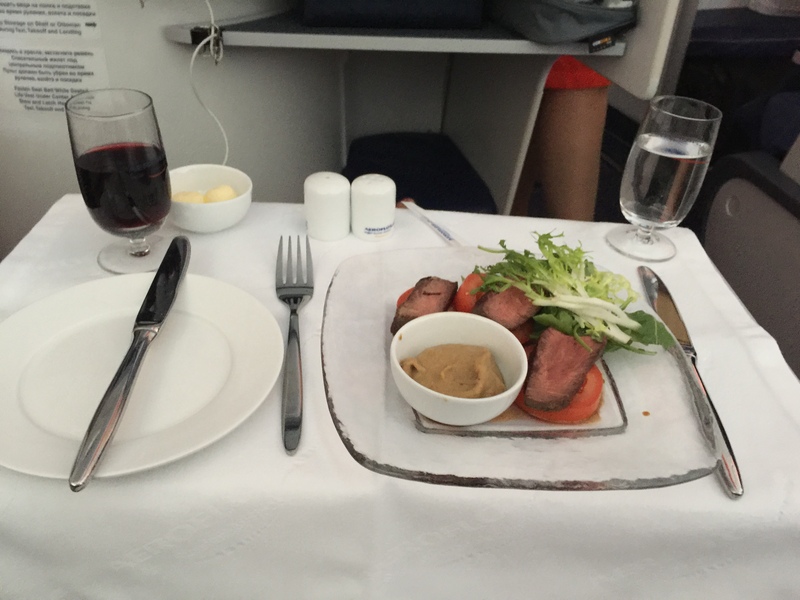 In fact, it was the best business class experience I’ve had on any flight, other than my first BC flight (the first time is always the best). I boarded the 777-300ER with ease and quickly found my seat, ushered by a gentleman flight attendant, who insisted on lifting my bag into the overhead bin for me. Within just a few minutes I was offered a sparkling welcome coctail (or I could choose juice or water). Shortly before takeoff the staff delivered menus to review for dinner choices. 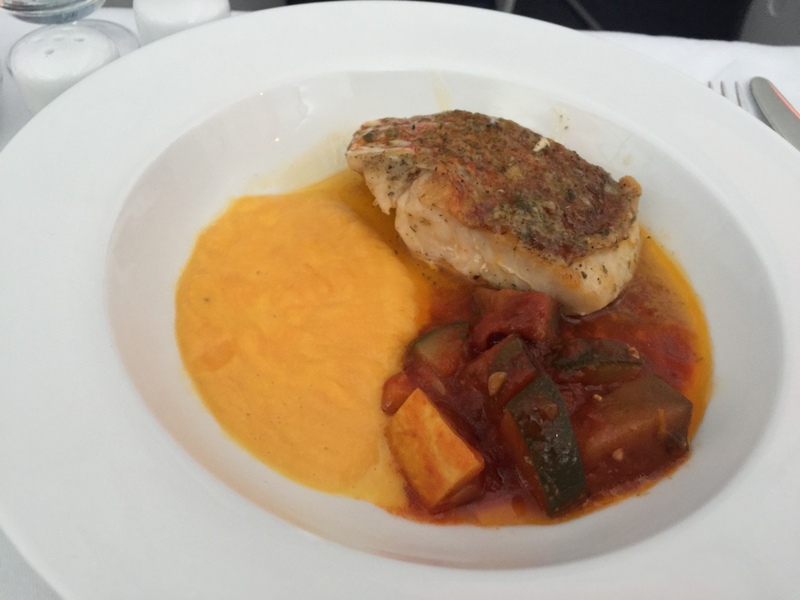 I chose the fish option, which wasn’t as bad as I’d feared. 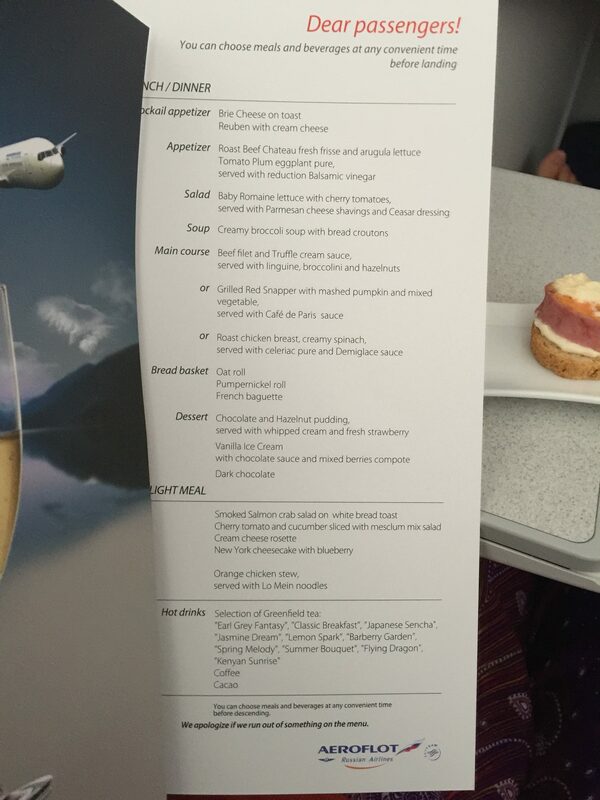 The thing that impressed me the most regarding the service on the flight, was that the attendants didn’t wait for everyone to finish something to serve the next course. 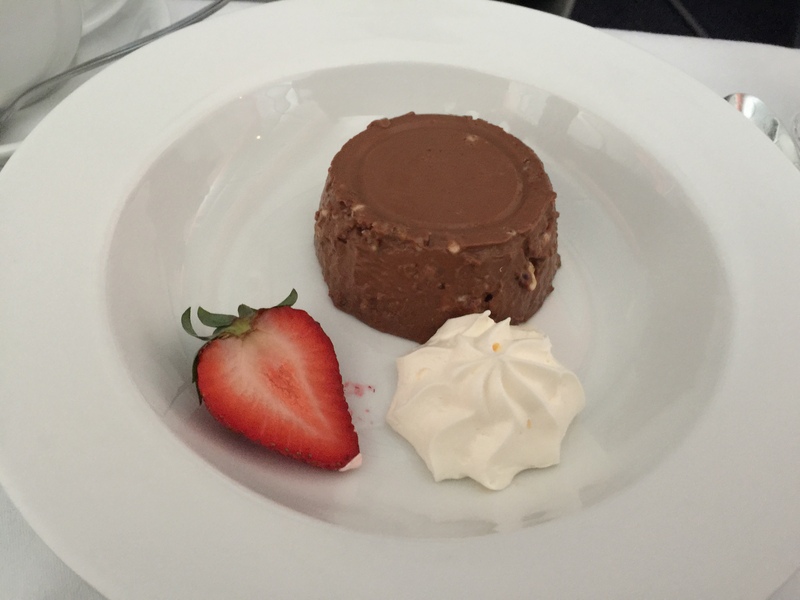 As soon as I’d finished one course my plate was whisked away and the next course was promptly delivered. This was wonderful because it allowed passengers who eat quickly to move on to the next portion of the flight: sleep! 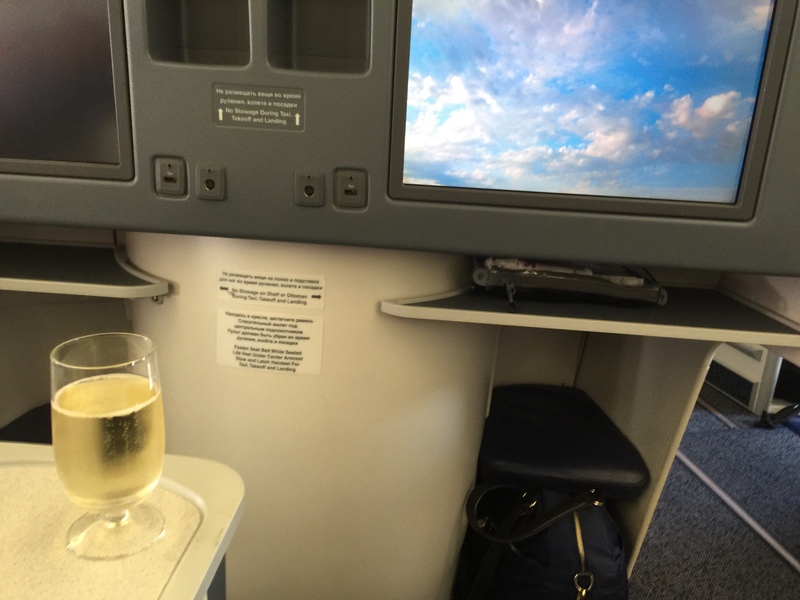 I am looking forward to my next business class flight on Aeroflot 101 from JFK-SVO. And if, by chance, I can’t score BC and must ride in coach, I will be sure to upgrade to a premium seat so my options to move around to find a more comfortable seat will be much better. 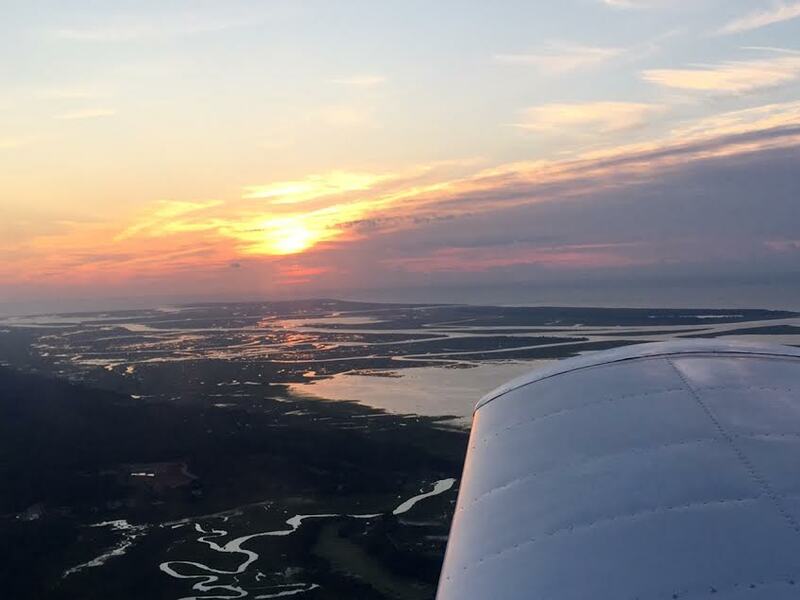 I flew JetBlue from Charleston to JFK recently. I was expecting an average or below average product from them because I’ve always thought they were a “budget airline”, but I was pleasantly surprised with my experience. Not only did the seats have way more legroom than any other economy class seat on any airline I’ve flown, they served full sized complimentary snacks! Not the tiny pretzel or peanut packs I’m used to receiving on Delta, but full sized snacks, which you choose from their basket. 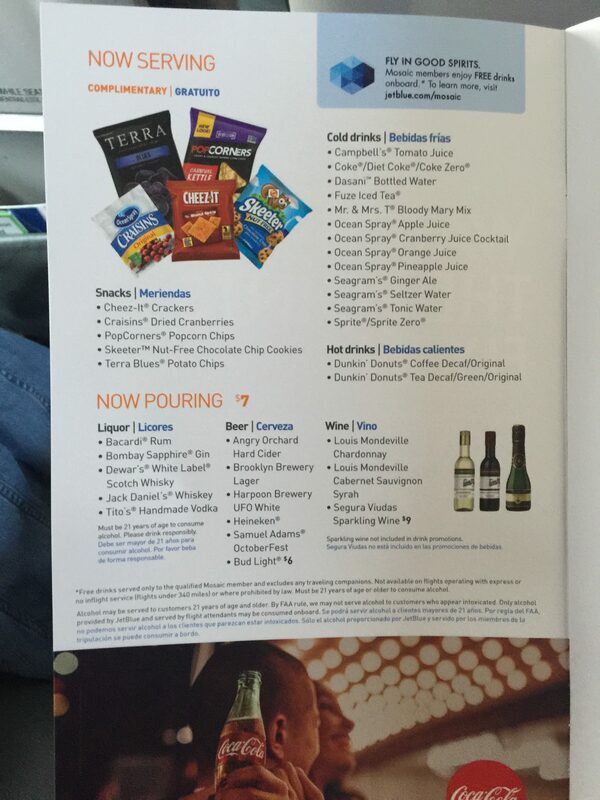 The snack basket you select from is very similar to the snack baskets on a regional Delta flight in Business Class. I’m really looking forward to flying with JetBlue again sometime, hopefully in the near future. 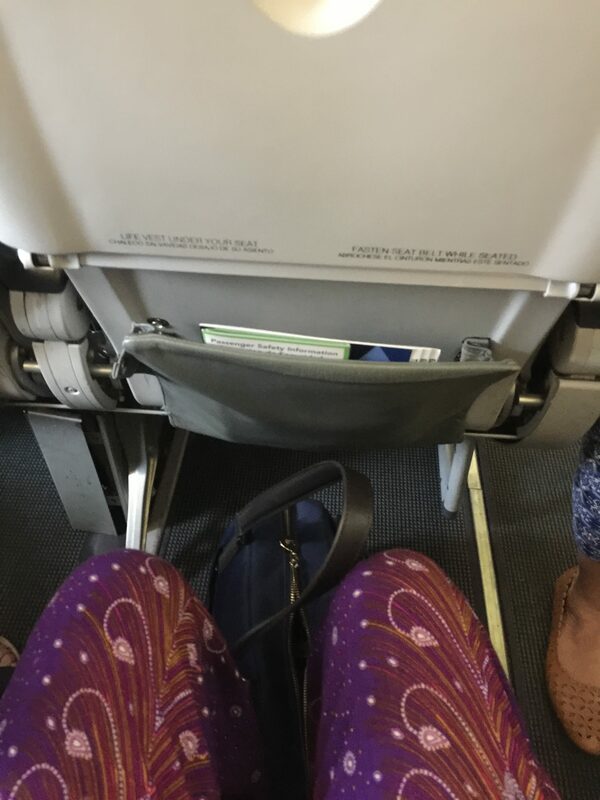 Look at all this legroom (and my groovy pants)! In case you need even MORE legroom. But really, unless you’re 7ft tall, I think you’ll be plenty comfortable. These are the snacks offered in the basket during flight. Yummy! It really is not possible to experience Barcelona in just one day, but if you are okay with just getting a little taste of the highlights, you can almost do it. We recently spent two nights and one day in this bursting city, and it was just enough to leave us wishing for more. This stop was during a EuroTrip my husband and I took with my son and my mother, so chaos was already the name of the game. Why not throw more insanity in the pot?!? We started our day with an early walk though Park Guell. This beautiful park is free to enter and, in addition to having beautiful artwork by Gaudi throughout the park, has spectacular views of the city. 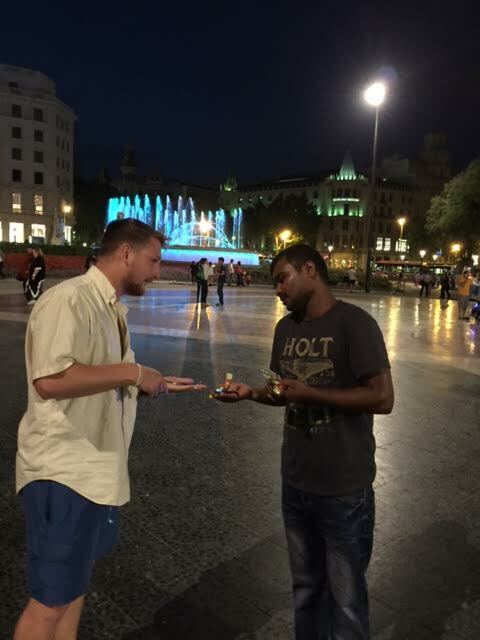 This is a must-see if you are visiting Barcelona, no matter how short your stay. One of our favorite sights in Park Guell is the “cat and mouse” game played by the illegal street vendors and the local police. The vendors have blankets with jewelry, hats, sunglasses and other wares laid out on the ground. As soon as an officer gets close they all scoop up their blankets and scatter. We found this dance to be quite amusing. 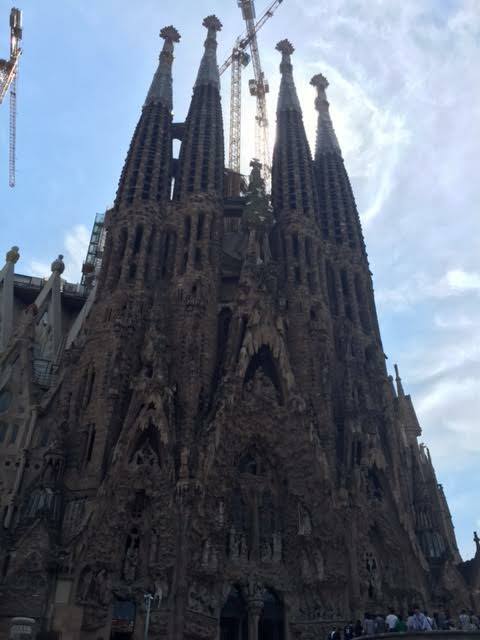 After leaving the park, we stopped to briefly admire the Segrada Familia, and then spent the afternoon wandering around Las Ramblas, the central boulevard in the center of the city. This seems to be the most happening place if you want to do any shopping, bar hopping or tapas tasting. You’ll also find plenty of souvenirs along this area, with artists selling paintings or charicatures, cheap gimicky toys, and all the typical wares you’ll find with the street vendors. 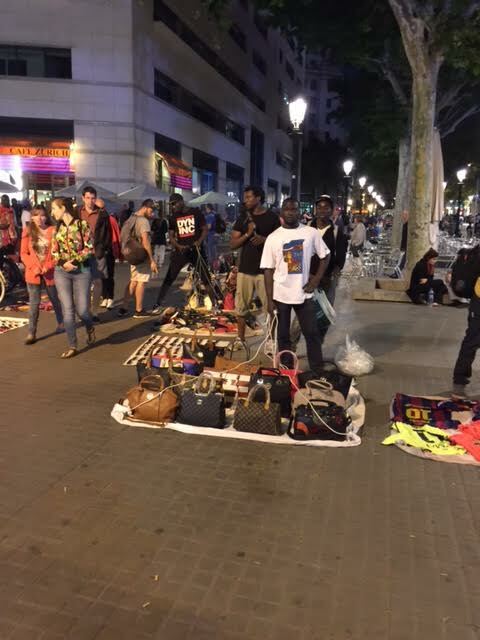 Some of the vendors are legal, but many are the typical illegal vendors with goods on a blanket on the ground. These guys seemed to be more clever by holding strings that were tied to all 4 corners of the blankets for a faster getaway. These guys were ready to run when the police approached! 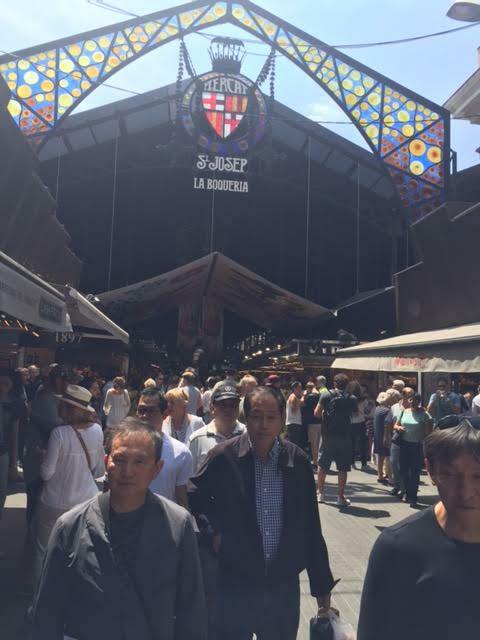 About halfway down the Ramblas, there is an amazing food market, La Boqueria, for a meal or a snack while wandering around. Some of the food is raw meat and fish for cooking, but there are many booths with fruits and vegetables, as well as tons of booths to grab candy by the pound, sandwiches, smoothies, alcoholic beverages or hot meals. 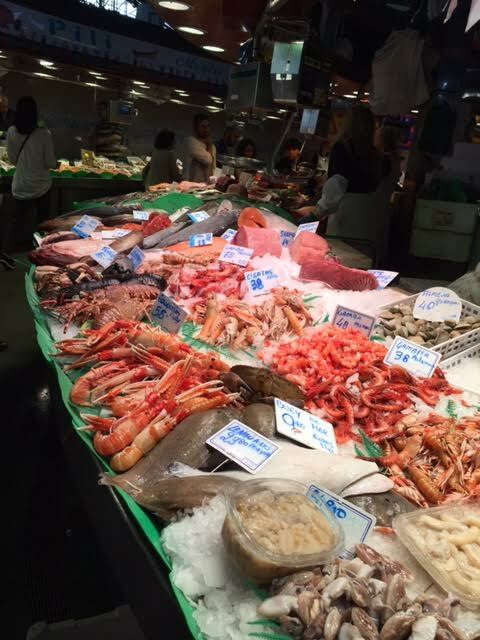 La Boqueria – Check out the size of those prawns! The Ramblas ends (or begins, depending on how you look at it) at Port Vell, a beautifully redone port with some impressive yachts and a pedestrian bridge (the Rambla de Mar) leading to some tourist attractions. The best tourist attraction is the Barcelona Aquarium, but I only say this from what I’ve read since I didn’t actually go there. While in Barcelona the food you must have is Paella, and I think you can get this anywhere. 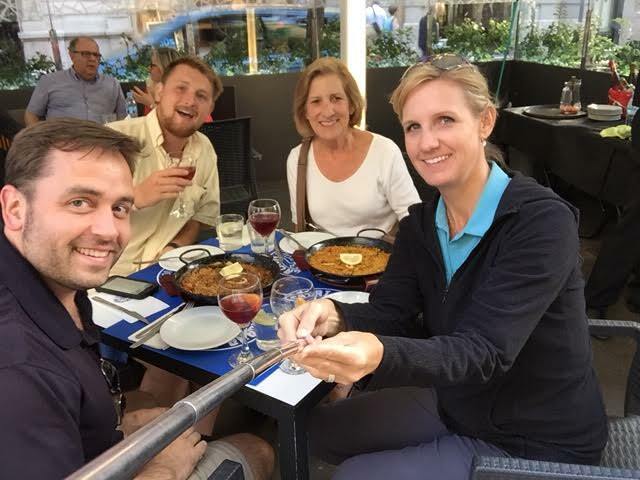 I’ve read that you should get this outside of the city center if you want the best bang for your buck, but since we were limited on time we took a chance and enjoyed a nice Spanish meal of Paella and Sangria right in the middle of La Rambla. Even if we paid a little more than it was worth, we were not disappointed. In fact, I think we enjoyed it a little more because of the location, since the “people watching” there really is the best entertainment around. Dinner and a show! Paella and Sangria, because Barcelona. Ole! We made the mistake of going to a Flamenco show in Barcelona. Don’t do it. 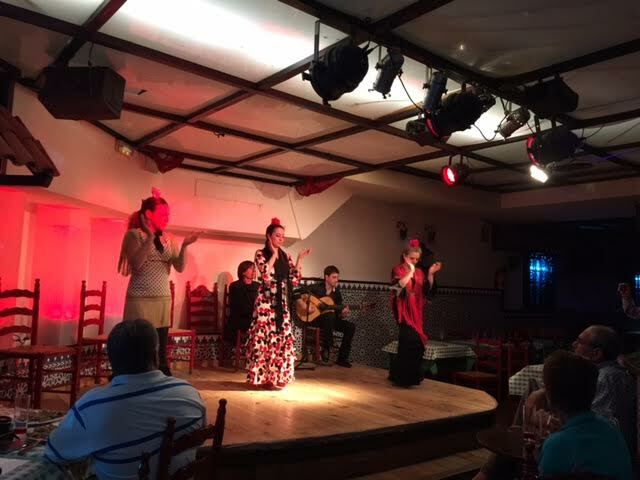 We saw a fantastic Flamenco show when visiting Seville, Spain once and thought this would be fun in Barcelona. It was a much different thing here and definitely not a quality show. It was more of a diner atmosphere with dancers. Trust me, don’t do it. Even the venue smelled like a mix of urine and Pine Sol cleaner. The only other patrons in the place were relatives of the dancers and they didn’t even eat the awful looking food they were served. I should have read reviews before booking this and I would have known that this is not the place for a Flamenco show. Lesson learned! The Barcelona version of a Flamenco show. No bueno. After the show we went to a few different tapas places. We met a couple from Ohio and another couple from Ireland at the first place, then we went with them to a few other places. Such a fun night! My mom still keeps in touch with the couple from Ohio. Isn’t it fun to make new friends in exotic places? We may have only been there for about 36 hours, but we proved that a grand time can be had in such a short visit. One of my favorite parts of this trip was watching my son bargain with the street vendors. Several times he tried to sell them things, like his leftover pizza or the raggedy shoes he was wearing. This kid is a trip! I have been unemployed exactly one week now. It’s not retirement. I’ve been calling it a “gap year”. College graduates often take a year off to travel and think about their next move, but I never had that chance since I was a single mom so young. So this is my “gap year”. So far, I’ve spent the week traipsing around NYC and helping my husband out on his business trip. With all this running around, I’d say I’ve earned my keep, at least this week. My Plan is to continue to be something of an assistant to B when I’m traveling the world with him, while catching up on some blog posts I’ve been putting off and thinking about what I want to do with my life. I will return to the reality of having a job someday, of this I am sure, but I am in no hurry to jump back into that world. For now, I am perfectly content to enjoy the life my husband has been enjoying for a few years, while working part time (when I am home) to earn enough for my next adventures. I never thought I would find myself in a position to enjoy this lifestyle, even temporarily, and I intend to enjoy every second of it! This is my dash, I need to make it as full of life as possible. John Burroughs said, “Leap, and the net will appear”. I’m putting my faith in that, as I gave my resignation letter to my employer today. After working for the City of Isle of Palms for 7 1/2 years, my last day of employment will be September 17th. The Isle of Palms is a small, (mostly) quiet beach town. I love this city and I have loved being a part of the community. I have also loved being a part of the police and fire family, along with the other city offices. 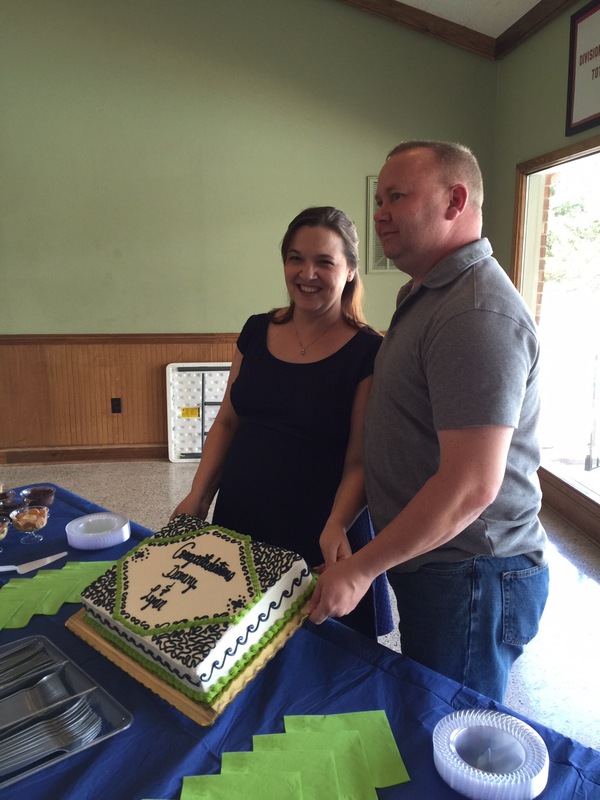 My decision to leave was not an easy one, especially since I regard so many of my coworkers with a familial respect and affection, but I feel this is the best decision for my personal growth, both personally and professionally. My immediate plan is to take some time off and travel with Ben on his business trips. After all, someone needs to spend those miles he earns. I think I’m up to the task! I don’t know what my next step will be. I’ll figure that out later. Life is for living. I’mma get out there and do that the best I can, while I can! Tagging along on one of my husband’s business trips, my mother, my son and I took full advantage of the super cool city of Amsterdam. 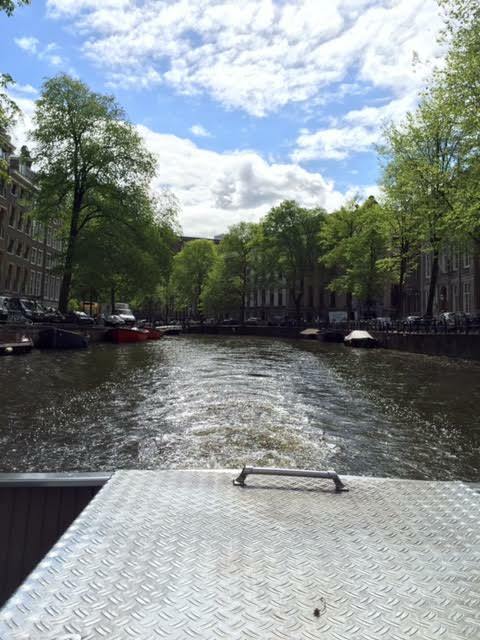 The first thing you absolutely must do when visiting Amsterdam is go on a canal tour. As touristy as it sounds, it is the best way to get a feel for the city, and it is also a relaxing way to enjoy the sights while recovering from a long flight if this is a first stop after crossing the Atlantic. Seeing the city from the comfort of a canal tour boat is a relaxing way to get acquainted with the city when you’re jetlagged. 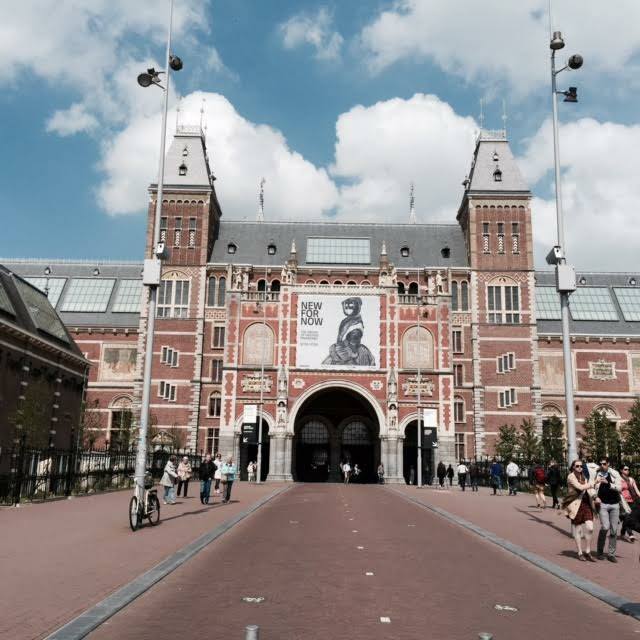 If you enjoy both art and history museums, the Rijksmuseum is a good bet for you. This beautiful museum has tons of pieces of art and history, but the building itself is enough to impress you even if you don’t care for museums. We also visited the Van Gogh museum, but I didn’t care for it as much as the Picasso museum in Barcelona or the Escher museum in the Hague, about a 30 minute train ride from Amsterdam. There are lots of museums and other tourist attractions that people rave about, but I am more of a fan of experiencing the city than seeing those sights. 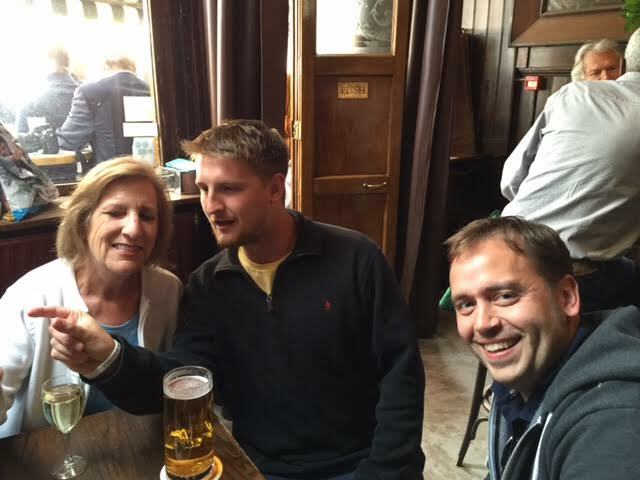 This is why I most recommend a stop at Café Hoppe for a drink in one of Amsterdam’s oldest bars. Café Hoppe has been on the Spui since 1670 and still seems to be a popular spot with both locals and tourists, alike. If there is one museum you visit while in Amsterdam, I recommend the Rijksmuseum. We are fortunate enough to have a friend who lives in Amsterdam who is always willing to show us around when we are there. 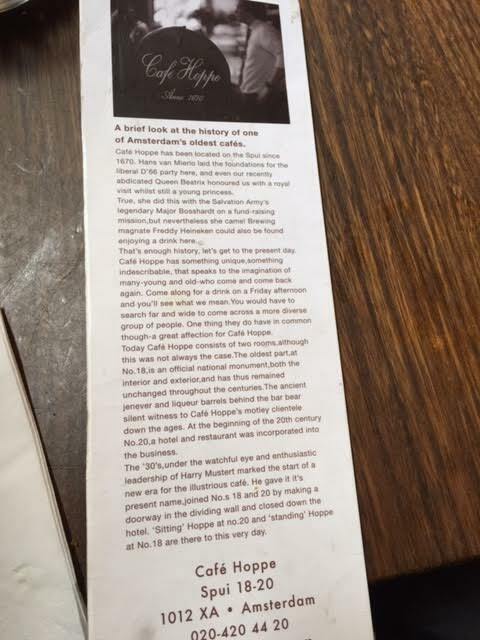 This was our 3rd visit to the city, and he once again graciously met us at Café Hoppe and gave a tour of the city. The tour he gave was exciting enough to please my 21yo son, and tame enough for my conservative mother to enjoy. 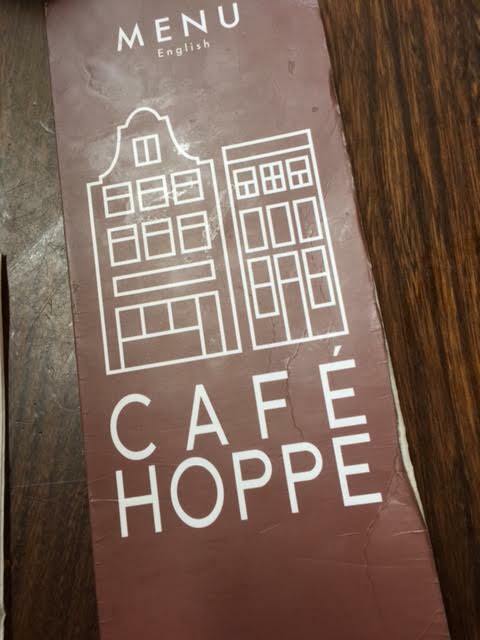 We can’t go to Amsterdam without visiting Café Hoppe at least once. I’m a sucker for street markets. Seriously, I seek them out in every town I visit. I love the combination of delicious food stand smells mixed with the excitement of possibly finding a great bargain. If you’re a people watcher you’ll also enjoy street markets. Amsterdam has a great street market called the Albert Cuyp Market. 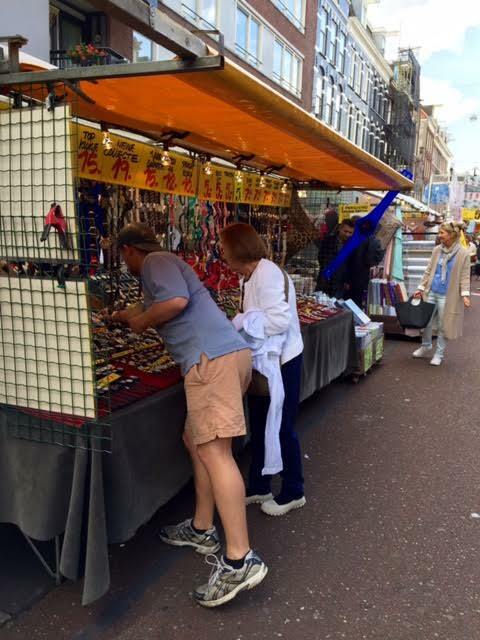 This is the largest street market in the Netherlands, with 260 stalls selling everything from meats and fresh produce to clothes, toiletries, bags, electronics accessories and cheap souvenirs. My son was on a hunt for a watch. There were several jewelry vendors with lots of beautiful watches to choose from. We found lots of bargains! 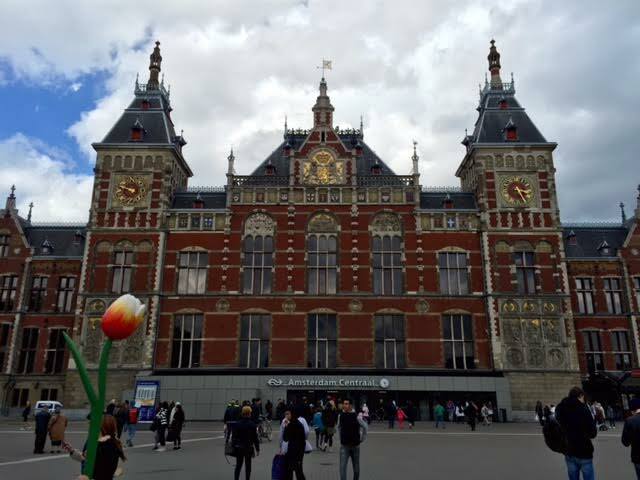 Amsterdam is a great place to begin a European vacation. Everyone I’ve encountered there speaks English and the Dutch are all such friendly people. If you’re on the fence about going to Europe because of the “fear of the unknown”, start with a few days in Amsterdam to warm up to it. You’ll be glad you did. Jump! The net will appear. Change is scary! It is so easy to stay inside your comfort zone and miss out on all kinds of exciting things that life has to offer. In 2003 I threw all caution to the wind and with a shout to the heavens of “what the hell”, I packed up my belongings, quit my job and moved to a new city where I knew no one. This may have been the most courageous thing I’ve ever done. Braver than learning to fly, even. Actually, this sounds way more adventurous than it actually was. To tell the truth, there was a series of events that led up to this leap. I hated my job, my house finally sold after 2 years on the market, my son was out of school for the summer, I had a golden retriever and a Jeep. On top of all that, my boyfriend of two years and I broke up as I was packing up to move out of my house after it sold. I was devastated, but also primed to jump out of the rut I felt I was in and into the life I knew I could have. I knew there would never again be a time in my life when so many cards were up in the air that screamed for a big life change. I packed up my things and drove down to Charleston without a clue about what would happen next, without knowing a soul, and without a job. I didn’t know what I was going to do, but I knew this was a leap I was going to take and that the net would appear. That net did appear, but not before I hit rock bottom. I struggled through several temporary jobs before hitting that bottom. From the bottom, the only place to look is up. There was one particularly cold night in February where I slept in my dark living room on the floor by the fireplace, crying myself to sleep because my power had been turned off. My son had gone to live with his dad in our hometown because I could no longer provide for him, so I was all alone, with just my dog, whom I could only feed because of a generous dog food donation from a friend. I couldn’t even call anyone for help because my phone had also been turned off. I spent almost a full year in a terrible, dark and lonely place and I realized I was doing all of this to myself. Self pity is a terrible thing. I was blaming heartbreak, but self pity was the real issue. I did a lot of deep digging in my soul that first year down here and I learned more about myself than I had ever though possible. I had been struggling with life for a very long time because I was trying to live up to perceived expectations from family and society; I had never really allowed myself to just be me. After a year of soul searching with the help of a lot of alcohol, I began to get a glimpse of who I really am and I learned to trust in myself. I also remembered that part of the reason I moved to Charleston was to change my life, which also meant my career. I had been trying to find a full time “respectable” job, but I realized that what I really wanted was a break from all of that reality. I decided to wait tables for a while, which was one of the other best decisions I’ve ever made. That made for a few fun and carefree years of living for the moment and making some really great friends. I have often said that this worst year of my life was also the best year of my life. Maybe it was because of the extreme growth I experienced, or maybe it was just because I was living at the beach, but that year will always be a very important era in my life. In October of 2005, around the time I really felt I was getting my life back together, I met my now husband, Ben. I cherish every step I took on that broken road. 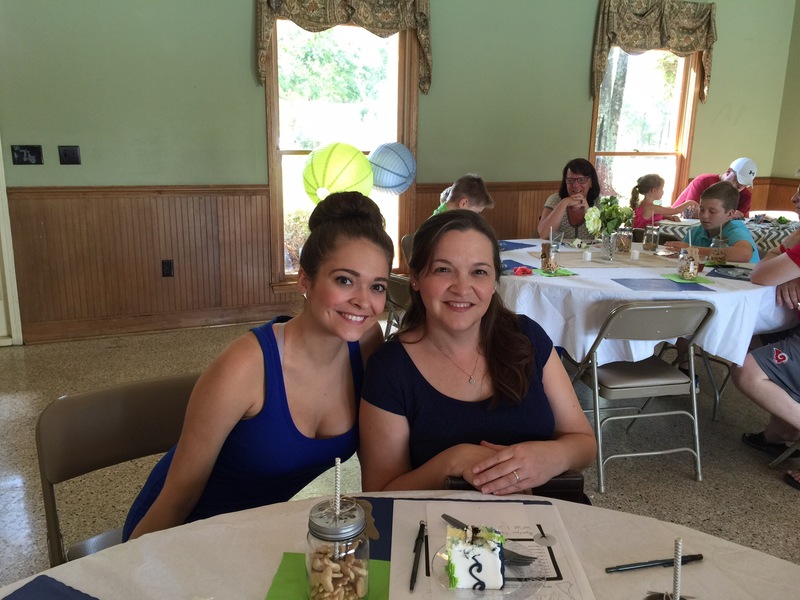 I became a mother while I was really still a child. Since I missed out on some major mental growth opportunities because of skipping college and growing up way too fast, those times were very necessary for me to become the person I am today. The person I am today is very happy to have been ready for the relationship that bloomed so beautifully into a wonderful marriage. Take that leap. The net will appear, even if it looks a lot like regret in the beginning. Just trust it.